Happy Monday ladies. So before I get round to what I'm wearing, I wanted to let you know about a new range of skincare that has just been released by REN Skincare. You may recall that I've only recently been introduced to the brand & blogged about a couple of their products here. Their new range is called Vita Mineral & focuses on hydrating & replenishing the skin, which for those of you who like me love the sun in the summer is just what our skin needs this time of year. Included in the range are a daily supplement moisturising cream, an emollient rescue cream, an Omega 3 skin oil as well as the lip balm & eye gel pictured above. One thing I really suffer with during the summer & in particular when on holiday is dry lips & no matter which lip salve I choose I always end up with my lips splitting, although luckily this year it wasn't quite as deep thanks to trying a new brand. So I know my lips desperately need re-hydrating, which is one of the reasons I choose to trail the lip balm. Another reason of course is that during the winter & running first thing of a morning when temperatures are low & have been below freezing I need something that will act as a barrier. The product is described as 'deeply replenishing' & one that will 'repair, soothe & protect dry or chapped lips' so perfect for my needs. With vitamin E to reduce UV induced damage, Hesteroside to calm & soothe & trace elements to boost cell energy & encourage cellular synthesis. As you can see from the below image of the product (shown on the right hand side of my hand) the balm is quite thick in consistency but not too thick that you feel your lips are heavily covered. In fact for times when you don't want to wear a lipstick it actually gives a nice coverage to the lips & has the appearance of a great clear lipgloss. For my first application I applied this just before having a mug of tea (so not the best time to apply) but it stayed on my lips really well so I was really impressed. In terms of usage I've only been using the balm for just over a week but already I can feel a difference to my lips & I am definitely going to continue using it to allow my lips to recover from the summer months & for protection during winter. In fact I'll be interested to trial it out next summer too to see if it will help stop my lips from cracking in the sun. Onto the second product (which is shown on the right hand side of my hand in the picture above), which is the Active 7 Eye Gel & is described as a 'cooling, hydrating gel that treats, revives & brightens....whilst minimising the appearance of puffiness & dark circles'. Now there are quite a few different bio extracts to this product each with it's own specific purpose but the one that really stood out for me as a positive was Laminar, which is supposed to encourage fluid drainage in order to decongest & revive tired eyes. Which seeing as my eyes are permantely tired & I suffer with congestion all year round I've got high hopes. Again I've probably not been using the product long enough yet to be able to say for definite if I prefer it to my normal eye creams but at this stage I'm definitely thinking that I shall start using this permanently as my day cream & then continue with my normal night eye cream. One thing that I did notice instantly was how lovely, cool & refreshing the gel felt to apply to my eyes & this was even when I used the gel that I had, had on my hand to take the above picture which had been warming on my skin for a good 5-10 minutes before I applied it. REN actually suggest storing this product in the fridge for an extra cooling effect but even without doing this I noticed the coolness, which may be down to mucilages from the fig ingredients which REN states gives an immediate cooling sensation. 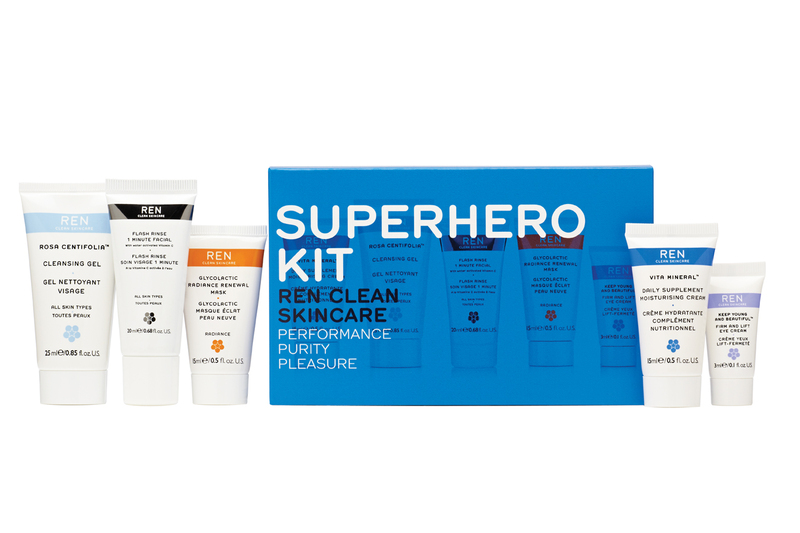 And the good news is that REN Skincare have currently got 20% off the entire range. So if you fancy giving some or all of the products a try just click here & use discount code VITA. Here's to a great start to the week & I'll see you in the morning.